How Does MULTI SEAL® Tire Sealant With KEVLAR® Seal Leaks And Prevent Under-Inflation Caused By Slow Leaks? MULTI SEAL® Tire Sealant with KEVLAR® coats the inside of the tire, dramatically reducing porosity. As the sealant spreads around the tire and rim, slow leaks from the bead, pin holes in the rim and leaking valve stem problems are fixed in a similar fashion to punctures. Because MULTI SEAL® Tire Sealant with KEVLAR® lasts the life of the tire, the need to frequently “air up” the tire is significantly reduced. How Does MULTI SEAL® Tire Sealant With KEVLAR® Work To Rapidly Seal Punctures? MULTI SEAL® Tire Sealant with KEVLAR® is a high-tech system of fibers and “fillers” in a carefully designed liquid suspension. When a puncture occurs, the escaping air carries MULTI SEAL® Tire Sealant with KEVLAR® to the hole. The fibers cling to the side of the puncture and form a “filter” which entraps the fillers. Together, they form a plug, which seals the leak with almost no air loss. As the tire flexes under load, the fiber/filler mass compresses to form a dense plug. The process will repeat itself for each additional puncture. NOTE: There is absolutely no drying, curing or chemical reaction taking place. 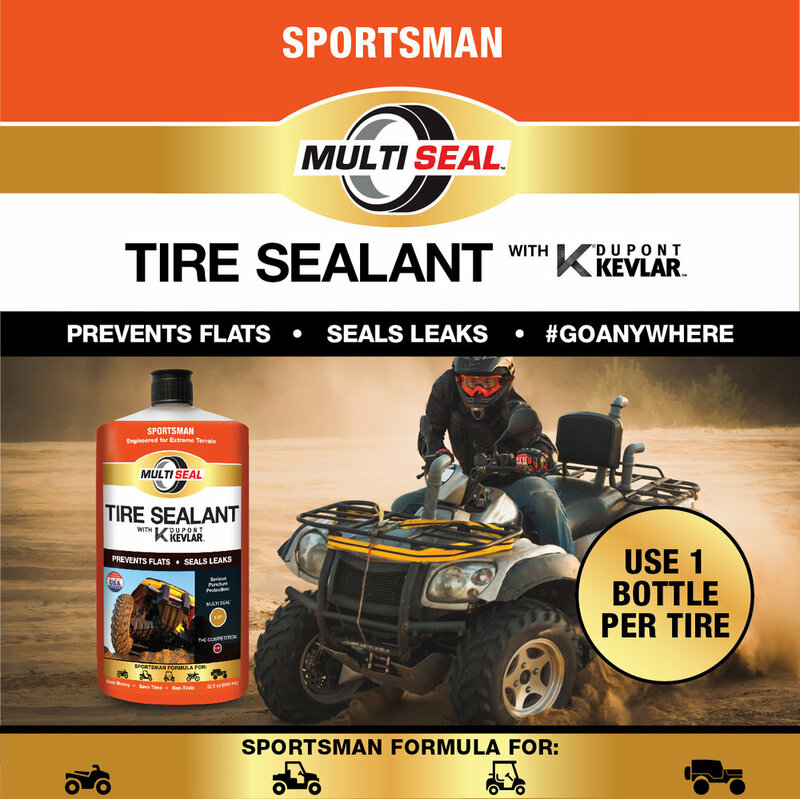 MULTI SEAL® Tire Sealant with KEVLAR® forms a mechanical/physical plug. Also, the process is the same whether or not the penetrating object stays in the tire.